Salad will keep for up to 3 days in a plastic airtight container. 19 members have added this recipe to their cookbook. 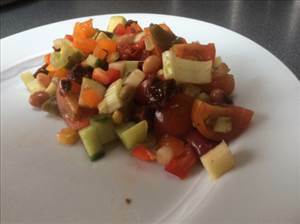 There are 133 calories in 1 serving of Mixed Bean Salad. Calorie Breakdown: 25% fat, 62% carbs, 13% prot.